By keeping a track of current market development and demand, we are successfully ranked amongst the best organization for providing PTFE Insulated Multicore & Multipair Cables. These cables are fabricated by our experts using supreme class raw material as per the set industry norms. The offered cables are available in different patterns and sizes to meet the varied needs of clients at leading market rates. 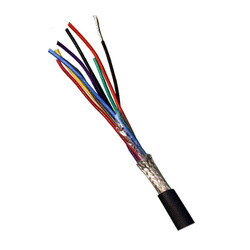 Our offered cables are highly recommended for its silent features such as precisely designed, easy connection and durability. We hold aptitude in manufacturing and supplying a broad exhibit of PTFE Multicore Cables. These are fabricated utilizing preeminent class crude material and most recent innovation under the supervision of our talented group of experts. Our offered extent is accessible in various lengths keeping in mind the end goal to meet the shifted needs of the customers. Accessible in different sizes, hues, lengths and thicknesses, these can likewise be redone according to the variegated needs of customers.